You know how it is. Sometimes you read books that are well-meaning and probably fabulous but you just didn't connect well with them for some reason or another. I have two such books to share with you today. Both were great in their own way but I just didn't get into them for one reason or another. Still, I think they are worth mentioning because both of them deal with subject matters which are near and dear to us as women, parents, and Christians. 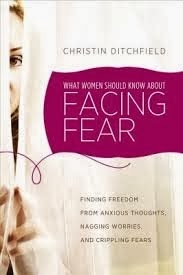 The first book is What Women Should Know about Facing Fear , by Christin Ditchfield. I accepted this one for review because I loved her book A Way With Words (linked to my thoughts) so much. And, if I'm going to be truthful, I also accepted it because I suffer from the overwhelming presence of fear more often than I'd like. I wondered if Ditchfield would have any insight or advice which would "strike a chord" with me and revolutionize my life. Alas, that did not happen but that is because the book did not have the power to do that. Only One can offer such perfect peace and Ditchfield isn't that One. Excepting one statement she makes in this book, I found the book to be fairly practical. She discusses her own issues of fear and how she has delved into scriptures to overcome such fears. She seeks to remind her readers of Who God Is (i.e., How big He is!) and to encourage them to place their faith and trust in Him, no matter the circumstances that they are currently facing. All good advice, solid and Biblical. My only issue, as I alluded to, was to a statement she made about how you cannot force another to get over their fear. She says that we must deal with our fear issues alone and you can't address the fear concerns of another. I see what she's trying to say (that God and God alone will deal with our issues) but I take issue with her choice of words. I think my fear exists sometimes because I don't speak it outloud and harbor thoughts inside. I fear because I fail to allow others to help me address it. When lies are brought into the light, truth removes fear. When I keep fears to myself I find myself even more fearful and in greater danger of acting out in some unwise manner because I refuse to speak my thoughts aloud so that they could be properly addressed. I think God created the church to help grow us up in Him and to help one another in our times of need. Sometimes we really need someone to come in and address us truthfully and in a loving manner. God uses people. Otherwise we could all live alone on dessert islands and be very, very holy. At any rate, I think What Women Should Know about Facing Fear has some useful encouraging words in it and Ditchfield does point her reader back to scripture and the Lord. If you are dealing with fear yourself and would like some "private" input into your thoughts and emotions then you might want to consider this book. I would just encourage you not to lose your fear concerns in this book but seek help. And that will probably mean putting a voice to the thoughts you've never wanted to speak. Many thanks to Leafwood Publishers for sending a copy of this book in order to facilitate this review. I have received no additional compensation and all opinions are my own. 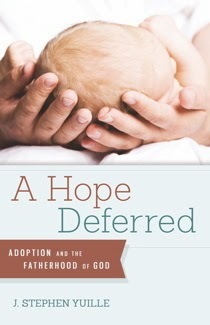 The second book I accepted for review (but didn't connect with fully) is A Hope Deferred : Adoption and the Fatherhood of God. I accepted this one for review because we have adopted and are in the process of adopting again and I'm always curious to see what other Christians have to say on the topic. J. Stephen Yuille is the author of this book and is an adoptive father himself. He and his wife's journey is different than that of Jonathan's and mine. They began the process of adoption after discovering that they were infertile without medical explanation. Jonathan and I both agreed before we had even gotten married that we would one day pursue an adoption. Both the Yuilles and ourselves are both parents to biological children now as well as adopted children. I see that what Yuille is getting at with this book which is ultimately to make his reader to understand that they are sinners saved by grace. Still, God's ultimate sovereignty does remain almost (-to-outright) offensive to some. We humans don't like to believe that God would simply not give us a child when we so desperately want one, for instance. That strikes at the very core of who we moderns have painted God out to be. Yuille argues (and I agree) that we must praise Him both when He gives, takes away, or holds back those things which we want. Easy to say, hard to believe when our hearts are so broken. Also, please note that neither Yuille nor myself would deny the need to comfort the broken hearted. While I believe in the sovereignty of God (and His "severe mercy" as it were) I am very grateful that God gives us people who will help comfort us when we are feeling our losses. Anyway, I don't know that I'd recommend this book to Any Couple on the Street who long for a child and don't understand why they do not have one yet. I think this book would come across as a painful slap in the face. (Which begs the question of whether or not the slap is necessary and/or deserved.) But if you are of the reformed faith and do adamantly believe in the sovereignty of God, are looking for a couple who has desperately longed for family and have held out with hope and faith in the Lord, then you should consider this book. It might be a soothing balm to you. For their desire was granted and they offer hope that the same can be true for you. If this means something to you - Tim Challies endorsed this book. To repeat: thanks to Shepherd Press for sending a copy of this book for the express purpose of facilitating this review. I have received no additional compensation for this book and all opinions are my own. I understand what you mean about it helping some times to voice our fears to another who can speak truth to us and help us. But I think I get what she is saying too, in that (at least this is my take on it) the fearful person has to take in it for herself, just as we can tell someone about salvation but we can't make them get saved. Once when I was watching a friend's little girl at night, the little girl (who was supposed to be going to sleep) was afraid (of what in particular, I never knew: she just said she was afraid). I told her I was there watching out for her, the doors were locked, no one could get in, and most important of all, God was taking care of us. With my boys, that would have been enough: they would have been comforted and gone on to sleep. She listened to me very thoughtfully, but when I got all done, she said, "Mrs. H., I'm afraid," as though I hadn't said a thing. I thought, "What do I do now?" :-) I think I just said more of the same. I guess you could say that means that sometimes we have to continue speaking truth to someone, that a one-time session won't always cut it, but on the other hand, all the speaking in the world won't change the person's heart until they accept it in faith for themselves.